When Brent set up the trip for him and Matt, he said Matt had fly fished when he was younger. We agreed whatever assistance Matt needed on the trip we would be there to assist. The boat floated off the gravel bar on falling water the guys made their way into casting braces. Brent had been working on his double haul and it showed. Matt, who said he fly fished earlier in life, had mislead Brent and me. You see from the very first cast Matt was getting distance, had good mechanics and had obviously fly fished a lot more than he let on. We floated a short time working the banks and while casting is a big part of fly fishing, the proper mend while nymphing catches the most fish. The guys quickly got it together and both were bringing fish from the banks to the net. We fell into a groove early in the float. Good conversation happens on most every trip and this one was no exception. Two friends catching up on the latest events of life is counted as a good day. Two friends catching up on the latest events of life and adding some fishing into the equation is an exceptional day. Catching up on the latest events of life while fishing and knowing the rest of your friends are working on that day is a huge bonus! Soon we were floating and the fishing picked up. Depth was critical and falling water was dictating where the fish were sitting as the river fell through its different levels. We hit the right depths and fished the river according to the contour of the different shelves, shoals as well as other types of structure. The fish are always looking upstream for the next meal and if an angler can get that fly to move with all the other stuff floating under surface, the catch rate goes way up. The Brent and Matt were moving their flies at the right speed and we were getting some better fish here and there. The weather on this day was very similar to the weather from the last report. We started under sunny skies then the clouds rolled in, light rain began and then the closer we got to the ramp the harder the rains came. The guys kept fishing and didn't let the wet weather stop them from moving those flies through the different structures. The rain continued and when the front came through the fishing slowed. Even though the front was moving through and the numbers slowed a little, the quality was better. The fish that continued to eat were fat and happy, well they were fat anyway. Some looked like they had never missed a meal and some didn't miss their finned friends meals either. We ended the day on one last rainbow and although we didn't get a photo it was quite a nice one. The guys had their day of fishing in the books. They caught up on the latest events of life while they were fishing. They did it while knowing the rest of their friends were working on that day and that was a huge bonus! To see the latest fishing report click here and for more booking information see our Homepage. 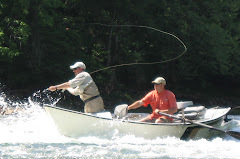 If you are a seasoned angler or have never picked up a fly rod and want to set up a day on the river just email or call/text 615-796-5143 to book a day on the water. Family fishing trips are some of the best trips. Gary brought his grandson Ellis on this trip to help him with his casting and naturally the catch-rate. I used to have to travel for hours to my grandparents and then we would add even more miles to get to Reelfoot Lake or Midway Arkansas, where we would spend days fishing. Ellis is lucky to have his grandparents real close, so a float for a day doesn't require a bus ride or time in the airport just to get there. Like I said he's a lucky guy. So, Gary's plan was to get Ellis into a casting, mending and hookset routine so their trips out West can be more productive on the fishing side. Ellis could cast pretty good before he got on the drifter, but we still found some things to work on. He's a polite young man and a good listener, so I didn't mind helping where I could and he didn't mind listening and learning. While we waited for just the right time to push away from the gravel bar, Ellis began refining his cast. Gary and I stood outside the boat as Ellis began his work. At first he had the sidearm cast going, which when casting to the starboard side was going to cause some problems for the old guys in the middle and back seat of the drift boat. We worked to raise the cast more over the boat, so we didn't get hooked throughout the day. We talked our way through that exercise and tried several different techniques to stop the forearm from dropping. Finally we landed on the right words and Ellis began bringing the cast over the boat. We shoved off on higher and stained water, but soon both Ellis and Gary were hooking fish on less than perfect conditions. We spent the day hooking fish and bringing them to the net. There were very few rises on the trip. This day gave me a chance to try a couple new midge patterns across a few of the better shoals. People who fly fish and tie their own flies are always tinkering with different patterns. The other day I heard about a type of Zebra midge that is tied with flash vs. wire. So I clamped some hooks in the vise and tied a few, then finished them off with some Clear Cure. The pattern worked well which means we will be fishing it under various floating things throughout the Spring. The guys brought their share and some other angler's share of fish to the net throughout the first part of the day. Ellis began picking his water. On one particularly good stretch of water Ellis spotted an old blowdown. He dropped the nymph just upstream and the fly tumbled past the structure. The indicator dipped, Ellis set the hook and played a pretty nice rainbow to the net. At that moment I think Gary and I both realized that Ellis "got it". As the afternoon changed to evening they continued casting, mending and then setting the hook. Only the weather changed. The weather went from cloudy to a light rain and then as we began our final push toward the ramp the light rain turned to an outright downpour. We stowed the rods and made our way to the gravel bar at the ramp. The drifter was drained of the rainwater and loaded on the trailer. And, now I think Ellis is all warmed-up for that trip out West while Gary has yet another reason to go to the river. This week has been a week of birthdays. Angler's have been coming to fish with me on their birthdays and it has been a lot of fun. The water release wasn't the best but Tim and I hit the river for a half day float. We warmed up Tim's casting arm and made our way upstream. Tim worked on pushing the rod with the thumb and he really turned his casting around with that and a few other techniques. Naturally we worked on the mend after he gained some distance. Well, all Tim's work must have paid off because the fish began to respond. When Tim would get a good cast and throw in a good mend he would get a nice tug. The fish weren't just falling for anything, but they were eating our flies. Other boats were struggling to boat fish and Tim was catching on a regular basis. Tim was casting well, mending well and setting the hook became more easy with each fish. You know it has been a good day when there are no flies lost, but several used up beyond recognition. After a good run for the afternoon we said "one more fish" and a short time later we were netting the fish and heading to the ramp. Tim it was another good day on the river. Thanks again. Snow or should we say ice has limited our trips to the river. Ramps were iced over throughout the week and high generation limited our choices for rivers. The latest round of ice and snow is the way Winter has said "no spring for you" (think the Soup Nazi episode). Yep other areas of the country are enjoying their nice weather and we were marred in ice and snow. Speaking of snow, the snow was just a bonus and as is common around here it has been melting since the day after it fell. The forecast is calling for even more rain so there will be no more snow at least that's what the weather guessers have said anyway. We would like to say the stain in the water is "run-off", but really it rained like crazy just before the cold front hit and it is probably just stain from the rain. Before anyone out West gets all worked up about having more runoff and we don't know what runoff is, well you're right and we want to keep it that way. The fish are still in the rivers and although they are probably a little chilly they are still eating. The full moon probably allowed them to eat around the clock this week. It appears the extra night light made fish a little more picky. Things Can Change: Tim's Ford was predicting 0 generators today. According to the Observed data there were two releases of big water. It could have been released down the spillway or through the generator. Either way be careful while fishing below dams especially right now. There is a lot of water being held back and a lot being released at times and the schedule doesn't always tell the entire story. The Caney Fork River: There has been a whole lot of water around the Caney and more is expected. Two generators around the clock is the story here for several days and then the Army Corps opened a couple sluice gates with all the generators. Even we are staying away. The overhanging trees are now in the way of a boat floating too close to the bank. In my humble opinion stay off the Caney until the releases are more back to a normal state. The Elk River: It is fishing pretty good for us right now. We've brought some good fish to the net and the numbers have been good especially considering the time of year. The holdovers seem to be doing well and are eating the usual offerings. The stocking points aren't really the place to fish at the moment. Anglers don't necessarily have to walk far to start picking up fish. If you aren't sure if the fish are biting, well you don't know if you don't go. Middle TN bugs: The bugs are hatching on sunny days. As usual there are some midges hatching here and there. Floating along we've seen several sporadic midge hatches on every trip. There have been a few caddis coming off here and there as well. The midge hatches have produced some rises. Actually the fish are taking the midges just before they break through the surface film. The caddis are not consistent enough to get and keep the attention of the fish, but we have seen a slight increase in catch rates when the bugs are popping. If you don't have your 2015 TN fishing license and you are on the way to the river, obviously the sled dogs will need some rest and what better time for them to take a break than when you stop to buy a license. You can purchase the license online or at one of your favorite sporting goods stores, some fly shops or even an occasional convenience store. If you made it to the river and still don't have your license you must be reading this on the ole cell phone. My suggestion, go here and get your license before knotting your favorite fly to your hopefully brand new tippet. The next steps you hear could be a TWRA officer... remember they are just doing their job and probably already have their 2015 fishing license. It looks like we won't get out until the weekend and then it is not "a gimmie" that we will be able to get to the ramps. 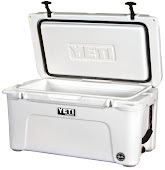 So just in case we don't make it out until sometime next week or June, surely we won't be iced in that long, the Fly Fishing Film Tour is in Nashville on Tuesday. If we can make it to the show, it will be fun to watch people we don't know, catch fish on bodies of water we may never fish. Really, it will be fun to watch those people we will momentarily dislike (hate is such a strong word) catch fish while their buddies film their big smiles, their rides in float planes, perfect casts on pristine waters....and well you know what I mean, heck I "dislike" most of them already and the film hasn't even made it past the title. But it looks like I may just be there again this year. Hopefully there is an extra hat or t-shirt with my name on it. The Phil Moahan Fly-Fishing Trivia Challenge is up over at the Orvis site. My score was 70% so it's obvious I don't know where most of these rivers are located...I admit there was a lot of guessing going on when I selected the radio buttons. While your over there taking the quiz, take a look at the How- To videos. There are some good tips and techniques including everything from knot tying, to hook removal, and even tricks to be a better caster. Finally the dates for trips are beginning to book. With favorable generation mostly on the weekends the best days to fish are filling. The ice, snow and blizzard-like conditions. OK, I know it's not blizzard-like but staying inside isn't my cup of tea. Anyway, with all the weather as of late we should see a turn around soon and I want to be on the river when it does turn around. Don't forget if you don't go- you won't know. This Winter has been brutal in many ways, but the time off the harsh weather provided has been needed. The latest round of ice storms and days of snowfall have kept us close to the Southeastern Fly Corporate Headquarters (or I should say upstairs at the tying bench) with one trip to the west to visit family. 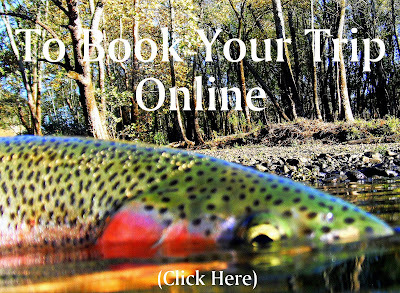 We are back on the river and booking trips into the Spring. We still have to make it through some rough weather, but it is shaping up to be a real good first couple months of the fishing season. Speaking of the new fishing season, if you are reading this and planning on fishing, get your fishing license and trout stamp because your yearly license from last year will not work when you meet with TWRA on that trip. The Caney Fork- Some of the area around the Caney has been iced in for over a week. The ramps were iced over and for a period of time there was not a clear ramp to put the boats in or to take the boats out. Things on the ramps are back to normal, whatever that means, and the fish still have to eat sometime. With that being said the water is a bit on the high side. 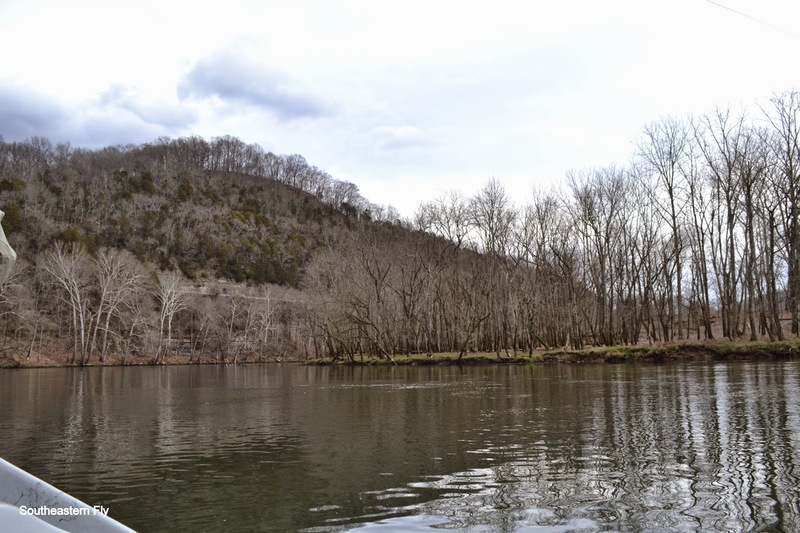 The water levels on the Caney are on the high side but the fish are healthy. Right now there is plenty of food in the river and this is making the fish more picky than usual. Nymphs are not the way to get fish to the net and dries aren't producing a lot of action either. Throwing streamers is the best way to get some attention. There is a chance to get a trophy on the Caney and to do that on high water it takes the ability to cast a streamer for an entire day. Not only does it take a strong casting arm and shoulder, it takes accuracy with that streamer. 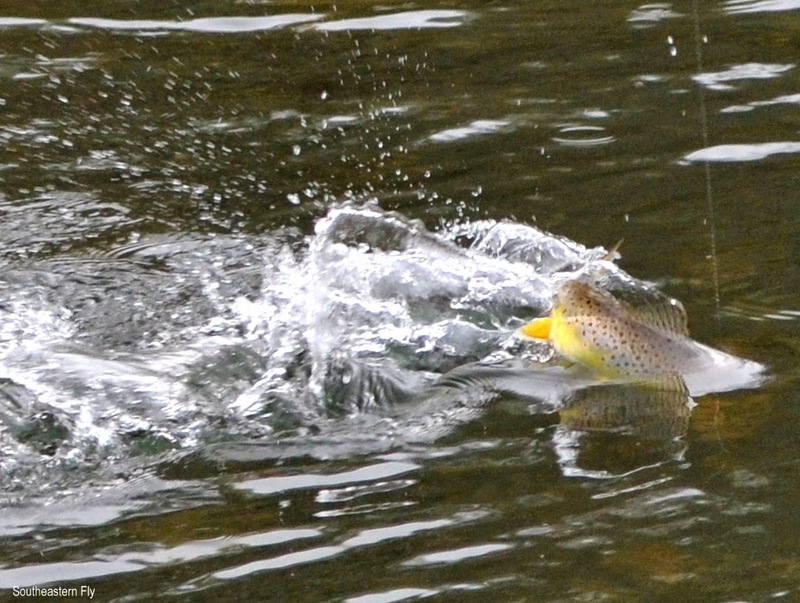 Getting the fly tight to the bank or to the exact spot on the gravel bar, that you may not be able to see, is critical. As stated earlier there is plenty of food in the river and the fish are full for the most part. It can be a grind for long periods of time if not most of the day. Keeping your head in the game is a must, because when a trophy shows up it is intense. The Elk River- This river has been giving us some times for low water floats. For some reason the fish haven't been responding to the streamer. So, we have been fishing nymphs and midges. I heard about a midge pattern over the cold months and began experimenting with different versions of the pattern last week. Armed with several versions we dialed in a couple different midges this week. You can work on patterns for months, thinking with every wrap they will the best fly on the river, but you don't know 'til you go. The new midges produced good results on the river, so we will be fishing a more dry/droppers in some parts of the floats throughout the spring. Nymphs are still the king of the Elk. If you don't have the right pattern it is tough to bring fish to the net. The wrong version of the right nymph can also put an angler in the weeds. Speaking of weeds the river bed is looking good now. There is still vegetation but the bottom is clean. The banks are also clean as we await the spring wake-up. The water has been clear too and that makes spotting the fish much easier. All this makes the job in the center of the drifter and at lunchtime easier. The Perfect Shot- The fish are pretty lively right now and they jump several times before finally getting to the net. This year I hope to figure out how to get a good shot of a jumping fish. If you are a regular reader of this report you've probably noticed more shots of fish as they come toward the boat. I hope you don't mind my less than perfect jumping fish shots. I hope to show some progress throughout the year. So, please bear with me as I work toward this goal. Jimmy the Net, a nickname that was somehow born out of bad tippet. Here we go. Early in a recent float Jim was drifting a nymph under a particularly good overhanging tree. I was picking the next likely spot and trying to scratch my ankle. Anthony was trying to figure out how to steal Jim's water...OK Anthony may not have been trying to figure out how to steal Jim's water, but there is a better than average chance that's exactly what Anthony was doing. Anyway, Jim has his nymph floating in some fishy water and the next thing we know he is coming tight on a fish. The fish puts a good bend in the rod, which shifts my attention from how do I scratch my ankle through these waders and wading boots to where'd the net go? Anthony and Jim start talking about the size of the fish and the first glimpse I get of the fish is the large tail... The net is under all the extra bags and jackets, because it was 26 degrees when we started this float and apparently it's my job to get the net. It's my job to get the net not only because Jim can't move all this stuff and fight the fish, but also because Anthony sure isn't going to help. Anthony? He is already winding up his cast to drop his nymph under the same tree Jim was just fishing. Jim was well into a fight with an above average brown and it was putting his Orvis Helios II to the test. Jim knows how to handle a big fish and was doing a good job staying ahead of this 20+ Club entry. While Anthony finally gets a good drift going and with his fly drifting under the tree and into a blowdown, Jim is fighting the fish and it makes a run along the length of the boat. We all get a real good look at this brown trout. Jim's got the fish on the reel, Anthony is just about far enough into the blowdown to get good and hung up and I am now thinking of a way to get the handle of the net inside the waders and down my leg so I can get some relief from this itching ankle. Then the fish began a slow run upstream. The fish got just enough speed and force that a short time later it was over. The tippet broke at the leader knot... Everyone was quiet for a short time and I briefly forgot about the itchy ankle. Being as we are all friends it was decided, mostly by me, to begin giving Jim a hard time. Anthony was quickly there to assist with the constant bombardment of fun at Jim's expense as we moved toward the blowdown to get Anthony's fly, that was hung in a small branch under the water. The best way to help a friend through the loss of a big fish is "to make it fun" for the rest of the trip. Anthony and I made it fun, at least for us, while Jim suffered the thought of the loss of that fish. Dude, nobody has ever lost a big fish like that before and now everyone is going to do it. Anyway, we helped him through his heartbreak by letting him row more than usual. He didn't even have to ask and the extra rowing really seemed to help. He also had the chance to net our fish on many occasions which may have been what earned him the nickname Jimmy The Net. He is now good at netting fish because we brought our fair share and Jim's fair share to the net. Practice makes perfect and all those other sports analogies work with a netter in training. And for the few times Jim was fishing, Anthony would take Jim's water just in case there was a big fish lurking. For those who don't remember and the one who wants to forget, remember Jim lost that big fish. Jim losing that fish started this whole story in the first place. Jim took it all in stride, but couldn't have done so without our "help". You're welcome Jim. The Paul Harvey or the rest of the story...A fish or two later we found out the loss of that fish may have been was definitely due to a roll of bad tippet. This isn't the first roll of expensive tippet I have seen that wasn't good. Jim's roll wasn't old and there weren't knicks in the many feet of the roll. It just had weak spots and plenty of them. We tied some less expensive but better tippet on the leader and the problem was solved. Jim didn't get a second chance at another 20+ fish on this trip. But, Anthony and I both had a better than average time on the river.